✅Please contact us for any problem before returning, as long as the product cannot work, refund is supported. Perfect replacement for cracked screen, white screen or dead pixels. Also replace damaged or faulty touch screen. 2. Watch the installation tutorial on YouTube. 3. Handle the vulnerable and fragile flex cable ribbon carefully. As the flex cables are very sensitive and are easily damaged. 4. Try to handle the repair or replacement work in a dry and dust free environment without direct sunlight. ✅ COMPATIBLE with SM-G900A (ATT), SM-G900P (Sprint), SM-G900T (T-Mobile), SM-G900V (Verizon), SM-G900R4 (US Cellular), SM-G900F (Europe), SM-G900 (Global) etc. 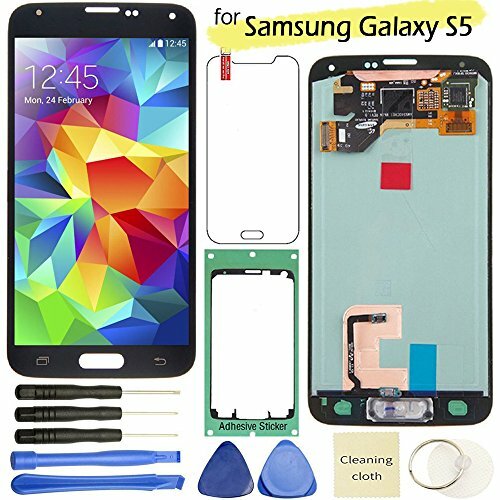 ✅ LCD, touch screen digitizer and front glass are pre-assembled, with the repair tools, adhesive sticker attached, make the installation easier. ✅ Corning gorilla glass 3 outer glass, super AMOLED touchscreen, 16M colors, 1920 x 1080 pixels, 432 ppi as the original one. If you have any questions about this product by Flying Ocean, contact us by completing and submitting the form below. If you are looking for a specif part number, please include it with your message.